This week we celebrated World TV Day which takes place on the 21 November each year. The United Nations General Assembly declared this day in 1996 in recognition of the increasing impact that television has on reporting conflicts and threats around the world. The World TV organisation states that there are at least nine reasons why the world loves TV - TV has authority, that it has been created by professionals, TV creates professionals, TV inspires the mind, TV delivers quality, TV goes hand-in-hand with sport, TV stimulates the economy, TV embraces the digital age, TV reaches consumers and builds brands. If you like millions of others in the UK enjoy watching TV then Intercounty Stansted has this house for sale that comes with its very own cinema room - the perfect place to catch up on a few dramas or the latest DVD releases. 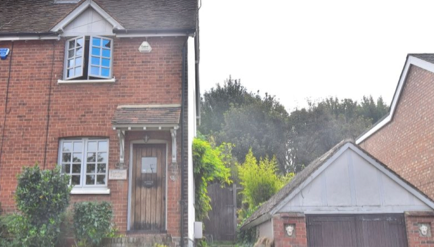 The house is beautifully presented two/three bedroom character cottage (featured above) situated in the centre of Stansted Mountfitchet within a short walk to the mainline railway station offers direct links to London Liverpool Street and Cambridge Station. The property further benefits from a wealth of character features, a large rear garden, a Balisian Summerhouse with cinema room and a garage and driveway.